Does your hair literally crinkle and sound like it will snap when you run your brush or hands through it? Join the club! There are so many people who have the same issue-- so many in fact that Aveda decided it was time to help us fix the problem with a new product! If you are a heat-styler, a less-frequent hair washer or you tangle easily, the new Shampure Dry Conditioner will be your new go-to product for your hair! We have found that using it helps detangle dry hair and give it some moisture without weighing the hair down. It is a heat protectant so it also is perfect for use prior using a flat iron, curling iron or wand on your hair-- even second or third day! It is perfectly paired with the Shampure Dry Shampoo for an easy way to stretch your blowout an extra few days! Shampure Dry Conditioner uses organic jojoba oil and sunflower oils to condition and soften your hair for ultimate shine and health. It has a 5-star rating on Aveda.com and is a staff favorite! We've been a little busy over at Thirty Hair as everyone is wanting new beautiful Summer hair! If you are like our clients, you are itching for some change, chopping off some length or brightening up your color. Here's just a peak of what we've done in the past few weeks! This guest chopped off 4 inches and had a heavy balayage toned to a cooler, ash blonde! It's that time of year for Holiday Happy Hours, Parties and More! We know many of you are limited on time and need easy ways to move from day to night makeup. Our resident makeup guru took the time to show you two easy looks- one for day and one for evening that work together! For your daytime look, you will want to start with your favorite face coverage. We love to use Aveda's concealer for under eye coverage and spot coverage before applying their tinted moisturizer and sealing it with their dual coverage foundation. For more coverage, dampening the sponge will create heavier coverage. For your eyes, Gobi Sands eye shadow not only creates the perfect, natural every-day eye, the lightly pigmented colors also compliment every eye color! The trio has a light, medium, and dark shade. Keep lighter shades closer to the inner corner of your eye and darker shades closer to the outside corner of your eye...this creates the illusion of larger eyes! We used Black Orchid as the go-to liner in both of our looks. For daytime, we lightly lined above the lashes for a subtle effect. For your lips, use a light color that brings out your natural lip color. Our personal favorite here at Thirty Hair used to create this look is Sheer Primose Lip Color. It is the perfect pink for a natural, yet refreshed looking lip. The nourish-mint mineral lip color provides sheer coverage while plumping and smoothing the appearance of fine lines. To transition to the evening look, we used deeper pigments & colors on the eyes and lips. For your eyes, we added Rosegold single eye shadow into the crease of the eye to deepen the color, we also added a winged liner using the same black liner to create more of a bold look. For your lips, we swapped lip colors to Carnelian, a deep burgundy color that compliments all skin tones! If you love either of these looks but want to have some lessons on how and what to use, schedule a holiday makeup session with Emmy any Saturday this month! We are a week away from our first intimate setting skincare and makeup event! On Wednesday, November 9 from 6pm to 8pm, we will be hosting 10 ladies for a special night of skincare knowledge, hands on lessons and makeup how-to's. This past Tuesday, Emmy, our amazing makeup artist, went through and taught us her five minute face with Aveda makeup. We learned a lot, asked lots of questions and had fun playing with new lipstick colors! There are only a few spots left so call to reserve your spot before it's sold out! Fashion Colors in Your Hair! Do you LOVE the pictures on pinterest and instagram these days with all sorts of rainbow and unicorn colors for your hair? We do too BUT sometimes we cringe when you show us those pictures at your hair appointment. Why, you ask? Because the reality is those colors are most definitely FASHION colors and take a lot of work to get there, a lot of maintenance to keep and most importantly, a lot of those pictures are edited before posting. - These Colors Take TIME. Expect your appointment to last anywhere from 2-8 hours depending on previous hair color, length of hair and current color. - These are fashion colors. That means they will not last forever. Expect to have a major upkeep involved when doing these colors. Here's a few snapshots of training for our class. We love love loved our educator, Jeffrey Scott from Aveda and learned so much not just about Fashion colors BUT hair color in general! Over here at Thirty Hair, we have the pleasure of taking classes with Alia from Aveda Education on a monthly basis. This past month, our class was all about dimension with new techniques. We learned a lot about how to blend our old techniques with the new ones. As a team, we tried out 4 new techniques on our mannequins and then continued grow by applying what we learned on both mannequins and real life clients. When asking for your handpainting services, know that there are many different techniques that can be used to get to your final result. Previous color services, length and condition of the hair are all huge factors when determining the best plan for your services each visit. One question that always comes up is the cost. Most balayage services are lower-maintenance but at the time of the service they take more product and time than the average service. 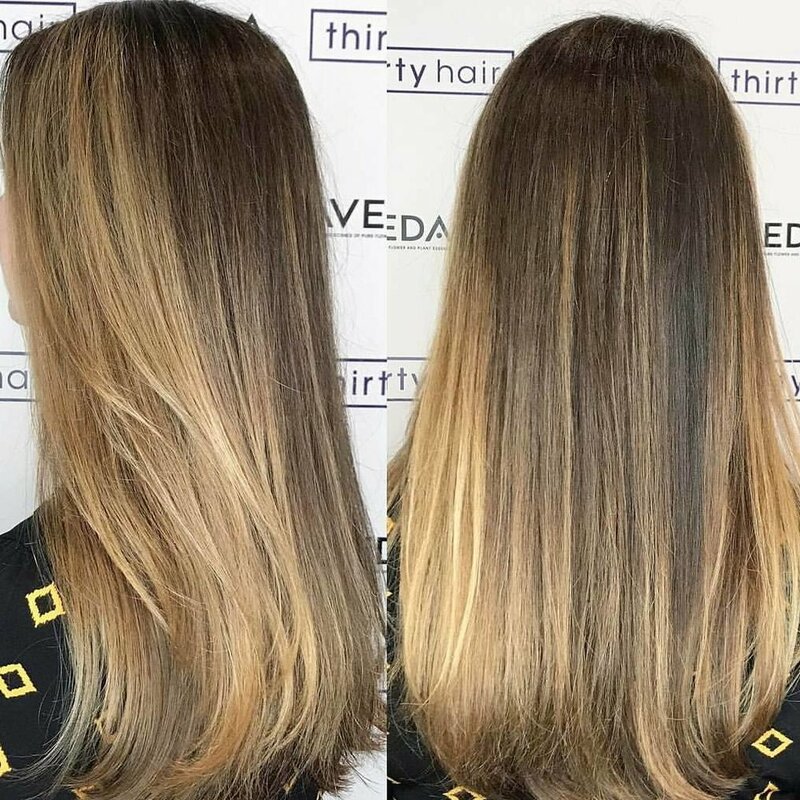 While you may not need to get the full service refreshed as quickly, you may need to get a glaze and conditioning treatment halfway between your balayage appointments. Sunscreen for the skin, face and hair! How about gone outside on a cloudy day thinking that it's just an hour and it won't be too much sun? The best is when you love to drive with your sunroof open but can't figure out just why your hair color especially on the left side keeps fading. When swimming, apply a leave in conditioner prior to jumping in the pool or ocean. Apply it and braid your hair or put it in a bun then enjoy swimming while not destroying your hair! Deep Condition after prolonged time in the water! Let it sink into your hair for a good 10-20 minutes for extra moisture and protection. Utilize a color-protecting spray such as the Aveda Sun Care Spray. It's amazing at keeping your color exactly the color you started with! Loading up on a great sunscreen. Don't forget your neck and ears though! Utilizing a tinted moisturizer with a strong SPF. Several of our stylists LOVE Aveda's Tinted moisturizers because they give a strong pigment while blocking out the sun. Great to protect you from aging, sunburns and it gives your skin an even glow! Wearing a hat AFTER applying sunscreen everywhere! Most importantly, remember to reapply!! We hope this gives you a few tips and tricks to help you these summer months. Stay Cool! The sun is FINALLY shining, it's getting warmer and we finally can tell it's SUMMER! What better way to celebrate than with some fun new summer hair color! Did you know there's a million ways to brighten and freshen your hair color while staying low maintenance? * Before swimming in any water, wet your hair down completely with tap water. We suggest taking some daily hair repair or shampure conditioner and work it through your wet hair and then place your hair in a topknot or a braid. It will keep it conditioning while you are having fun in the sun and protect if from tangles, sun and water damage. * Deep conditioning more frequently will help protect your hair from more mechanical damage and environmental damage. Summer time, we tend to flat iron more to keep our hair smoother and less frizzy and in turn, we cause more breakage issues. Using Smooth Infusion Masque or Damage Remedy Mask will help to alleviate the frizz issues and remedy split ends. *Clarify your hair after swimming with the right shampoo. Remember that many clarifying shampoos are not color-safe and strip your hair of your color and also strips you of all your natural oils. We highly suggest the Sun Care line for summer hair. It helps remove chlorine and mineral build up, rebalance dry scalp and keep your color safe! *Use Sunscreen!! Remember places like tops of your ears, your part line in your hair and your neckline. Many people are already complaining of sunburns on their part especially when wearing braids which are a major trend this summer. Keep yourself protected from the sun's harm! Some great product tips of DIY styling! Looking for a New Style? Ready for a change in 2016? So is our staff at Thirty Hair! We are currently working on our Hair Goals for 2016! Are you looking for short, long, dark, light or something drastic? Balayage, Ombres, Sombres, Hand- Painted Hair... What does it even mean?! Sombres, Ombres, Babylights, Balayage, what are all these terms and how in the world do I get the perfect lighter dimensional hair color? Look no further than this post for an explanation of what to ask for next time you're in the chair! Since I have finished hair school, I have played with lots of different color lines and lets just say Aveda is my favorite! I love that I can change each formula to fit everyone who sits in my chair because let's be honest we don't all have the same head of hair. That being said, I love to change my haircolor. Earlier this year I was a redhead and thanks to olaplex, within two visits, I was a blonde with no breakage! I decided I was ready for a change which turned into quite a project thanks to Sarah, who is training me on Aveda Color. 2015 is the year of pastels so of course I had to try out the trend! Over the year, we saw so many stars rocking the pastel pinks, blues and purples. For a while now, I have been dying to have rose gold hair and haven't been able to find just the right formula in an easy fashion. I tried several brands as Aveda isn't always known for it's pastels and funky but Sarah pushed me to look outside the normal formulation box with Aveda and figure out how to break it down to make the perfect rose gold. Thanks to how Aveda formulates, with a little time and thought, you can make any of your color wishes come true if your stylist is willing to put in the effort. When trying to figure it out, I turned to one of Aveda's best color educator's Lupe Voss for her insight. That's the cool part about this industry, we have all these amazing artists who are willing to help others grow. So I started with research on Lupe Voss's instagram and her group chat on hairbrained. After I found what I thought were good formulas, I took real hair and tried swatches of the best two formulas I had come up with for the perfect rose gold. HELP! I colored my hair at home and it's TOO dark! Hi all! My name is Isabelle, and I am Thirty Hair's newest employee! I am currently assisting Sarah and learning the world of Aveda! One of the best things I have learned in my first month here has been about blowouts. Here are my top 3 tips for a perfect Salon Blowout at Home! 1. PRODUCT PRODUCT PRODUCT! It is all about the product you use and how much you use. Less is more. My favorites for a long lasting blow out is the Brilliant Gel by Aveda and the new Smooth Infusion Smoothing Cream by Aveda. 2. Get the moisture out first!! It might sound silly but the easiest way to get volume in your hair is to flip your head upside down until your hair is 80% dry. Then start to do the work with the brushes to get your style in place. Once the roots dry, they are basically stuck where they dry, so make sure if you want volume that you give them volume! You can always tweak the ends with an iron when it's dry. 3. Round brushing is key! It's all about the the smaller the brush the more of the curl you will get. So it all depends on the finish look you want. This blog is for all the men out there! Yes, we write a lot about different hair color trends and makeup lines, but do not think we have forgotten about our guys! As the fall season rolls around there are new styles coming out, and this includes men's hairstyles. One that we have particularly taken a liking to is the hybrid look, and no, we are not talking about the car. This look can give the guy a sharp cut with a little bit of messy when styled. This hybrid blends a tight fade to scissor cut on the top with lots of texture. This is a really easy style for a guy to have because you can use a little gel to style the hair on top, or you can let it air dry and wear it as is. Either way, you have a look that's in, and people will definitely notice! To top off your new hairstyle don't forget that we have a whole men's line of Aveda products available at our salon. Pick up some shampoo and grooming cream for a fresh new style for Fall 2015! Fall Activities in Howard County! Here at Thirty Hair we are all about community, and getting involved. That's why we are writing this blog to let all of you know what the fall happenings in Howard County are. There are so many fun and inexpensive things going on that are perfect for this new season. There is always the good ole Clark's Elioak Farm which is just the place to bring the whole family to. There are modest fees to enjoy a day full of fun from the petting zoo to their newest attraction which is the Enchanted Forest Pine Tree Maze. Along with this farm adventure, there are others holding similar events such as Larriland Farm and Sharp's at Waterford Farm. Several of us attend Larriland every fall for their extremely large selection of pick your own pumpkins, apples and more! On the weekends, you can check out the boo barn, straw mazes and go for a hay ride, maybe even having the pleasure of Rich, Lisa's husband, driving you! These places are packed with activities for children and adults that can make for some amazing memories to hold through the holidays that are quickly approaching. As for you lovebirds out there, there is even something for you! The event is called the "Rail-Trail's Fall Foliage Romantic Hike or Bike", and is the perfect outing that includes a little exercise too. It is a 20 mile trail that ends at Lake Elkhorn which is a terrific location for picnicking. With all of these fun things to do this fall there will never be a dull moment! Head over to www.visithowardcounty.com for more information on these events, as well as other events that were not mentioned. Enjoy, and happy fall y'all! Ever feel like you just need to sit down and take a deep breath to get away from the craziness of your day, week, year? Want to gain strength and power with it? You can do that too! As a working mother of two busy bees many know how hard it is to find time for myself. I have only been self taught and motivated. So if I can find time in my spinning world, you can do it too. Even my kids get into crazy pretzel-like twists! There are so many health benefits to yoga. Not only is it good for your heart and mind having a peace surrounding you as you breathe and move with your breath, you can greatly improve flexablilty and overall body tone in the process. Whether you start by going to a studio to practice or just jumping on your mat at home at the end of a work day, as long as your getting involved, I love it! All I ask is that you give it a week. There are so many beginner tutorials on Youtube and Amazon prime that you honestly dont need to even leave your house to start. Want a quick boost for fine hair? Lisa, our resident fine hair stylist who loves to make hair bigger without looking like you are from texas wanted to fill everyone in on a great Aveda product for thickening hair! At Thirty hair, we love Aveda's Pure Abundance Hair Potion. This powder can be sprinkled at the root to increase the diameter of each strand and create volume. Puff the powder into your hands and transform to a texture potion to scrunch for that beachy look. When trying to determine how much to use, tilt the bottle back and forth 2-3 times and then pour what is in your cap into your hand for maximum effect. Do any of you ladies out there have hair masks in your shower? Do you use them or are they in there for show :) Did you buy it because it looked cool or you read an article about how a hair mask would rock your world but you never really understood how to use it or what it would do? Well don't you worry, we love hair masks at Thirty Hair and I am here to help you figure the lovely world of hair masks out and how to make your hair even more amazing thanks to them! Okay first, if you started reading this and decided it wasn't the article for you because your hair isn't super damaged so you wouldn't benefit from a mask-- you are wrong. Hair masks are great for EVERYONE, you just have to find the right mask for you! Second, while there are a ton of DIY mask recipes out there, to get the optimal results you need to truly follow the recipe exactly and do your research on exactly what you are looking for in a mask with the ingredients. In all honesty, I prefer to be able to do my research in other ways and have it premade. It makes it much more convenient to use in the frequency I like to utilize a mask. For masking, you need to determine your needs and your availability. Ideally, you want to mask once a week. If your hair is in serious need, you can mask more often or rotate which mask. When my hair has been in serious trouble or it has been ridiculously humid outside (can anyone say frizz?!) I have utilized a mask every time I've washed (which would be every few days) until I felt like things were better under control. So have frizz? There are masks out there for frizz such as smooth infusions new smoothing masque or if you wear your hair naturally curly, check out the new be curly intensive detangling masque. Have breakage and damage? You want to look for a mask that gives you both strength and a little moisture as well. Strength is usually labeled as protein in different product companies. Aveda usually uses quinoa for their strength, especially in their Damage Remedy line. That mask is my absolute favorite. Hair feel like hay? Drier than the sahara desert? Check out one for moisture that includes a good oil base to it. We utilize the Dry Remedy mask. Sometimes we will recommend rotating the Dry Remedy and Smooth Infusion to utilize both the shea butter and buriti oil from each line. Once you determine the mask, figure out how you want to use it. I personally recommend using your mask on the day that you are going to take a little longer showering (such as the day you are going to do all your personal grooming aka shaving). I quick wash my hair, get out as much of the moisture from my hair as I can, apply the mask from my ear area down then work it up to my scalp and then I wrap it up into a bun on top of my head and enjoy the rest of my shower. I try to have the hottest shower possible for the steam to help the mask penetrate. When it's time to rinse, I rinse as cool as possible even though that's hard for me! You can also apply the mask on clean damp hair and wrap in saran wrap or a shower cap to trap the heat in and let it sit on for as long as I can. Overnight is even okay. I then rinse extremely well. If you have fine hair, you can lightly shampoo and condition if you are worried about being too greasy. Masks are definitely a great way to keep your hair healthy. It won't completely fix split ends but it will help mend and prevent split ends from getting worse. The only true way to fix split ends is to trim them and maintain them. Hair masks are the way to protect your hair, help fix frizz and moisture, and provide more shine to your hair. Have questions? Schedule a shampoo, conditioning mask and blowout with one of our stylists. We love helping you pick out what's best for your hair! Help! I need a new stylist! Tips to finding a new stylist! !